Ronny Gunnarsson. Logistic regression [in Science Network TV]. Available at: https://science-network.tv/logistic-regression/. Accessed April 23, 2019. This web page provides more or less detailed information about logistic regression. Logistic regression is a common statistical technique and understanding more will help you understand the results in many publications. This page also contains advice if you want to analyse your own data using logistic regression. The ability to adjust for other covariates. The importance of each variable can be given while simultaneously adjusting for the influence of other variables. This usually gives a better reflection of the true importance of a variable. There are techniques to reduce the number of variables so only the relevant ones remain This reduces the problem of multiple testing. Let me explain the latter using an example. Assume we want to know which variables differ between two groups, those who have experienced an illness compared to those who has not (or it could be those who say yes to a question compared to those who say no). Also assume that we want to investigate 50 different variables, some being categorical while others are continuous. Using chi-square or t-test to compare the two groups would result in 50 p-values, some below and some above 0.05. However, a p-value below 0.05 can occur by chance. To compensate for the possibility of getting statistical significance by pure chance we need to lower the limit where we consider a statistical finding as significant. There are multiple ways of doing this. Just as an example using the simple Bonferroni adjustment means that only p-values below 0.001 should be considered as statistically significant. A consequence is that very few or none of the calculated p-values would be considered as statistically significant. Using logistic regression as described below reduces this problem. We would first use some technique as a sorting mechanism to decide which variables to put into the second step, a multivariable regression. A common scenario is to start with 50 independent variables. It is reasonable to believe that 2-5 variables remains statistically significant in the final model. Assume that we finally get 5 p-values (with odds ratios). According to Bonferroni any p-value below 0.01 can now be considered as statistically significant. Consequently we have substantially reduced the problem with multiple testing. The two arguments for using multivariable binary logistic regression (when the dependent variable is dichotomous) rather than a simple group comparison would also apply to multivariable linear regression (if the dependent variable is continuous) and multivariable Cox regression (if a time factor is the dependent variable). You have enough observations to investigate your question. The number of observations you need should be estimated in advance by doing a sample size calculation. The dependent variable is a binary class variable (only two options). Usually this variable describes if a phenomenon exists (coded as 1) versus does not exist (coded as 0). An example can be if a patient has a disease or if a specified event happened. Categorical variables must be mutually exclusive. This means that it must be clear if an observation should be coded as a 0 or as a 1 (or anything else if the categorical variable has more than two values). There should be a reasonable variation between the dependent variable and categorical independent variables. You can check for this by doing a cross-table between the outcome variable and categorical independent variables. Logistic regression might be unsuitable if there are cells in the cross-table with few or no observations. The independent variables do not correlate to much to each other in case you have more than one independent variable. This phenomenon is labelled multicollinearity. You should test for this when you do a multiple binary logistic regression. Any continuous independent variables must have a linear correlation with the logit or the binary dependent variable. The model constructed will not fit well if there is a non-linear correlation such as a polynomial correlation. You do not need to test for this before doing the logistic regression but checking this should be a part of the procedure when you do the regression.. Ensure that all variables are coded so interpretation of the outcome is facilitated. If you have a class variable (categorical variable) ensure that coding is sensible. If one variable is ethnicity then the question is if you should have one option for each possible alternative or merge them into fewer groups. This depends on your focus and how the individuals relates to the different options. It might be worth considering if merging several alternatives in categorical (class) variables into only two values/groups might facilitate interpretation of the outcome. Data cleaning: Do a frequency analysis for each variable, one at the time. You are likely to find some surprises such as a few individuals with a third gender or a person with an age that is unreasonable or more missing data than you expect. Go back to the source and correct all errors. Recheck all affected variables after correction by doing a new frequency analysis again. This must be done properly before proceeding. Investigate traces of potential bias: Have a look at the proportion of missing data for each variable. There are almost always some missing data. Is there a lot of missing data in some variables? Do you have a reasonable explanation for why? Can it be a sign that there is some built in bias (systematic error in the selection of observations/individuals) in your study that may influence the outcome? Adjust independent variables to facilitate interpretation: Quite often a few variables needs to be transformed to a new variable. It is usually easier to interpret the result of a logistic regression if the independent variables are either a binary or a continuous variable. A class variable with several options might be better off either being merged to a binary variable or split into several binary variables. For continuous variables it may sometimes be easier to interpret the result if you change the scale. A typical example of the latter is that it is often better to transform age in years to a new variable showing age in decades. When you want to interpret the influence of age an increase in one year is often quite small but an increase in age of one decade is usually more relevant. Other examples are systolic blood pressure or laboratory investigations such as S-Creatinine (a blood test to measure kidney function). Decide strategy: Do a univariate (=unadjusted) binary logistic regression if you have only one independent variable. However, if you have multiple independent variables then you need to choose a strategy for including independent variables in your analysis. There are a few different possibilities to do this. The first approach (4A) is the best. However, that is not always possible so you may have to use another strategy. Decide due to logical reasons / theories (expert advice) a combination of independent variables and use them. The number of independent variables should not be too many, preferably less than 10. This would be the preferred method if you have a good theory of how to link the variables to each other. Do a multivariable regression with all available independent variables without having any theory if these variables are meaningful. This may work if you only have a few variables. If you have many variables it is likely to result in a final model containing many useless variables that can be considered as clutter. Hence, avoid doing this. If you have many independent variables and no theory of which ones are useful you may let the computer suggest which variables are relevant to include. This would be considered going on a fishing expedition. You can read more about this below. Do a simple logistic regression with one independent variable at the time. Save the output. This step is just to sift out variables of potential interest for further investigation. Hence, the outcome of this unadjusted regression is not part of our final results, it is just a sorting mechanism. There is no given rule of where to have the cut off to let variables proceed to the next step in the analysis. A p-value between 0.05-0.2 should work. If the previous step shows that more than one independent variable from the preceding step are put forward for further analysis then you must check these for zero order correlations. This means checking if any of the independent variables of potential interest correlates strongly to each other. If that is the case then you must make a choice before proceeding. There is no clear cut definition of a “strong correlation”. I suggest that two independent variables having a Pearson (or Spearman) correlation coefficient above +0.7 or below -0.7 with a p-value <0.05 should be considered as being too correlated. If that is the case then you need to omit one of them from further analysis. This choice should be influenced on what is most practical to keep in the further analysis (what is likely to be more useful). The best way to do this in SPSS is to do a standard multivariate linear regression and in the Statistics button tick that you want Covariance matrix and Collinearity diagnostics. Ignore all output except these two outputs. The next step is to do a forward or backward stepwise multivariate logistic regression. When you do this remember to tick the casewise listing of residuals in the options button (if you are using SPSS). Carefully investigate if a lot of observations are excluded in this analysis. The reason for this is a lot of missing data in one or a few variables. This may represent a potential bias (data are not missing randomly but for a reason). A backwards elimination regression is best if you have more observations than variables. A forward inclusion regression is best if you have more variables than observations (not an ideal situation). In SPSS look in the output for one table labelled Casewise list. This table lists observations that does not fit the model well. Their raw data should be checked. You may want to consider removing extreme observations with a ZResid value above +2.5 or below -2.5. Criticism has been raised both against using simple regressions and stepwise regression procedures as described above since this may end up with a final model that is not the best one. Other regression methods, labelled regularization, are now recommended for reducing the number of variables and modify their relative weight. There are different techniques within the concept of regularization such as logistic lasso regression, logistic ridge regression, logistic L1 regression, logistic L2 regression, logistic Gauss regression and logistic Laplace regression (there are more…). These techniques are now considered superior to stepwise logistic regression . Cox and Snell R Square is a kind of pseudo R square statistics. A higher value is better. Nagelkerke R square is an adjusted version of the Cox and Snell R square. Many statistical software packages delivers this if you tick the right box when you command the software to do logistic regression. It describes how well variation in the the dependent variable is described by variation in the independent variables. Zero means that the new model is useless and 1.0 that it is absolutely perfect. Thus, the higher the better. A simple and reasonable (although not entirely correct ) translation is that a value of 0.10 means that roughly 10% of the variation in the dependent variable is associated with variations in the included independent variables. If the Nagelkerke is below 0.1 it means your model only explains a small amount of the variation in the dependent variable. A good model would typically have a Nagelkerke R square of >0.2 and a value of >0.5 indicates an excellent model. Sensitivity and Specificity and predictive value of test are calculated for a given cut of of the probability for having the outcome. These values can be presented for any cut off but the most commonly used cut off of is a 50% probability of having the outcome. An extension of sensitivity and specificity is a Receiver operating curve analysis (ROC) analysis. It calculates the sensitivity and specificity for all possible cut offs in probability for the outcome. Look at the figure for Area under the curve (AUC). This usually goes from 0.5 (the model is as good as pure chance) to 1.0 (the model is perfect). AUC is also labelled concordance statistics or “c-statistics”. An AUC between 0.50-0.60 indicates that your model is hardly any better than pure chance (which is bad). An AUC above 0.80 usually indicates your model is quite good and above 0.90 is absolutely excellent. ROC analysis is a separate analysis requiring you to save the estimated probability for the event for each observation when you do the logistic regression. The Omnibus Tests of Model Coefficients (provided by IBM SPSS). A low p-value indicates a good calibration. Hosmer and Lemeshow test investigates if the new model describes the observations better than pure chance. A low p-value indicates that it is not better than pure chance while a high p-value says your model has good calibration. This test is too sensitive if you have large data sets. Many statistical software packages delivers this if you tick the right box when you command the software to do logistic regression. Most often you would use 100% of your observations to create your model and then use the same 100% to validate your model. This is labelled internal validation and should always be presented. You can use 70-75% of your observations to construct your model and 25-30% of them to test your model. This might be a good idea if you have many observations. The ultimate test is to apply your model to another set of observations obtained from another site / context . Validating your model in this new set of observations estimates how useful your model is outside where it was constructed. This is labelled external validation. Excellent models would have a good overall performance with high discrimination and calibration in both internal and external validation. Achieving this is very rare. Logistic regression is about calculating how one or several independent variables are associated with one dependent variable, the latter always being dichotomous. For each of the variables you are likely to have some missing data. If you do a multivariate logistic regression (more than one independent variable) these missing data vill accumulate. Hence, you may have 10% missing data in one variable and 10% in another. However, the 10% of observations having missing data in one variable may be different observations than the observations missing in another variable. Hence, 10% missing data in one variable and 10% missing in another may in worst case add up to 20%, and so on. For this reason it is important to look at the total proportion of observations that could not be used in this multivariate logistic regression. 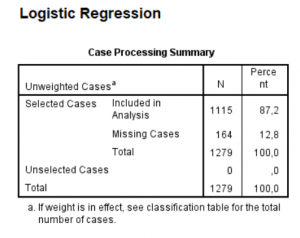 See image to the right where a total of 12.8% of observations could not be used because they had missing data in at least one of the variables. A large proportion of missing data is alarming and could potentially be a sign of some systematic problem that needs to be clarified. The logistic regression results in an odds ratio for each of the independent variables. The odds ratio can be anything from 0 and upwards to infinity. Odds ratio can never be below zero. An odds ratio of 1.0 means the independent variable does is not correlated to the variation of the dependent variable. If odds ratio is more than 1.0 it means an increase in the independent variable is associated with an increase in the dependent variable (more likely to be a 1 rather than a 0). If the odds ratio is less than 1.0 it means an increase in the independent variable is associated with a decrease in the dependent variable (more likely to be a 0 than a 1). It is essential to check how the dependent and independent variables are coded. Independent variables being measured with an interval or ratio scale are usually automatically coded with their value. Hence, a value of 5 is 5 in the regression analysis. This may not be the case with variables measured with the nominal scale. You need to look up how this is coded by your software because it decides how the result should be interpreted. In the image to the right we can see that the dependent variable is from the start measured by an ordinal scale being transformed into a new variable by introducing a cut off. 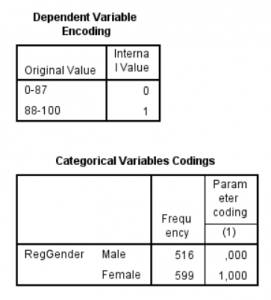 It is important to understand that variables originally being 88-100 will be coded as 1 and values 0-87 as 0 in this regression. It mean the odds ratios will predict a higher value of the dependent variable rather than the other way around. We can also see that for gender the software chose to code female gender as 1 and male as 0. This means the odds ratio for the independent variable gender will give the odds ratio for being female is associated with having the higher range of the score in the dependent variable. Female gender is associated with a decreased chance of having high score (odds ratio is below 1.0). Increasing age is associated with a decreased chance of having high score (odds ratio is below 1.0). The age is here stated in decades so we get the odds ratio for an increased age of one decade. Smoking is associated with a decreased chance of having high score (odds ratio is below 1.0). Smoking is here stated in 10th of pack years so we get the odds ratio for an increase of 10 pack years. Simply present data in a table (see practical examples below). This must be done anyway and it is not always a good idea to do more. Investigate the consequences of dichotomising all independent continuous variables except one. Sometimes the explanatory power of the model (measured by Nagelkerke R-square and AUC) only goes down marginally with a few per cent. This price might be acceptable to enable presenting a complicated finding in a much more user friendly way. If that is the case it enables you to create a user friendly probability nomogram. This is often worth investigating. Create a complicated probability nomogram (unlikely to be user friendly). Create a web based calculator where the user puts in information and a probability is calculated or make a phone app that does all calculations when the user puts in data. This is likely to work fine even if you have several independent variables measured by a continuous scale. Antimicrobial resistance in urinary pathogens among Swedish nursing home residents : Table 4 shows how to combine the outcome of several bivariate (=univariate) logistic regressions and a following multivariate logistic regression in a single table. Prognostic factors for work ability in women with chronic low back pain consulting primary health care: a 2-year prospective longitudinal cohort study : Table 4 shows how to combine the outcome of several bivariate (=univariate) logistic regressions and a following multivariate logistic regression in a single table. This publication also demonstrate how the outcome in a multiple binary logistic regression can be presented as probability nomograms (Figure 2). The latter is recommended if your final model only contains one continuous variable and a limited number of categorical variables. Predictive nomograms can be constructed also for models having more than one continuous variable but they tend to be complicated and less intuitive. Predicting conversion from laparoscopic to open cholecystectomy presented as a probability nomogram based on preoperative patient risk factors : Table 2 shows how to combine the outcome of several bivariate (=univariate) logistic regressions and a following multivariate logistic regression in a single table. This publication also demonstrate how the outcome in a multiple binary logistic regression can be presented as probability nomograms (Figure 1-4). This manuscript also clearly states that the bivariate regressions are only considered as a sorting mechanism and the outcome of them are not considered as a result. It states that only the remaining variables in the multivariate regression is the actual result (and adjust the level of significance accordingly). Forward or backward stepwise regression?